A book that shares twenty-five years of professional knowledge in an easy, visual and educational manner: boiling, frying, curing, pickling, blanching, marinating, grilling, smoking, pan-frying, and many other essential techniques that you can put into practice with 80 easy, delicious recipes. This is a definitive guide to the secrets of cooking by the best chef in the world. The best chef in the world teaches you how to cook. 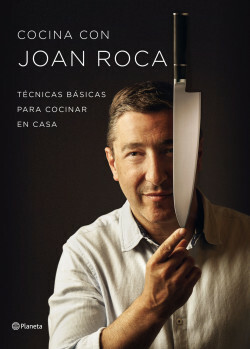 Cook with Joan Roca teaches us, step by step, with over 2,000 photographs, the main techniques for preparation, cooking and preservation. He also explains the essential basics and foundations to all cookery. The cook demonstrates every aspect of cookery: how to organize the weekly shop, the basic tools, the essential cuts, taking care of food, seasonal products, tricks and advice to optimize our cooking and the best way to conserve foodstuffs, plus a selection of 80 simple recipes that put all the techniques described in the book into practice.